Over the coming weeks, ABA will work with the New York Times Book Review on initiatives to help booksellers feature and promote the 2017 Best Books list. Here are the 20 Indie Next Great Reads and 12 Now in Paperback titles featured on the January 2018 Indie Next List flier, which is on its way to stores in the IndieBound movement. The December Indie Next List’s 12 Now in Paperback titles are featured with bookseller quotes on a downloadable flier and shelf-talkers. Based on sales at independent bookstores nationwide for the eight-week period ending November 12, 2017. Based on sales at independent bookstores nationwide for the eight-week period ending October 29, 2017. 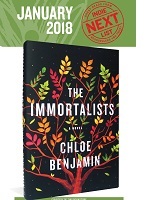 Here are the 20 Indie Next Great Reads and 12 Now in Paperback titles featured on the December 2017 Indie Next List flier, which is on its way to stores in the IndieBound movement. The November Indie Next List’s 12 Now in Paperback titles are featured with bookseller quotes on a downloadable flier and shelf-talkers. The Winter 2017–2018 Indie Next List for Reading Groups includes booksellers’ top 10 favorites plus 33 additional titles that offer the promise of great discussions for reading groups of every kind. Enthusiasm is high for the October 10 release of Turtles All the Way Down, John Green’s first novel in five years. In celebration of the Major League Baseball postseason, here is the Indie Baseball Bestseller List, based on sales at independent bookstores nationwide for the eight-week period ending October 1, 2017. The October Indie Next List’s 12 Now in Paperback titles are featured with bookseller quotes on a downloadable flier and shelf-talkers. The National Book Foundation is announcing the longlists for the 2017 National Book Awards this week. The Man Group has announced the six authors who have made the shortlist for the 2017 Man Booker Prize for Fiction. Random House Children’s Books is inviting stores to participate in “Celebrating Twain: A National Read-Aloud-A-Thon” to promote the release of Mark Twain’s new never-before-published children’s book. Based on sales at independent bookstores nationwide for the eight-week period ending September 3, 2017.